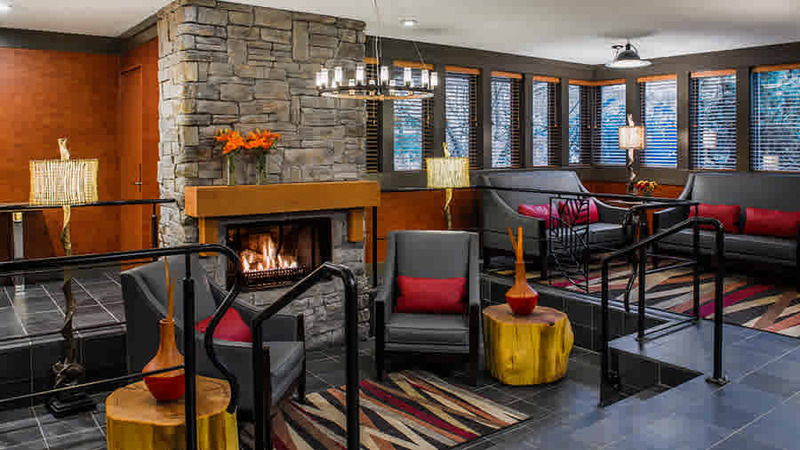 Whistler Village Inn + Suites hotel offers a tempting and comforting combination of a "walk anywhere" location, warm and friendly service, value and style. That's why so many couples, families and groups come back time and again to experience the best of Whistler-Blackcomb from right here. Choose from 86 rooms, lofts, studios and suites - complimentary wifi - many of which include wood-burning fireplaces, kitchenettes, flat screen TVs and fully equipped kitchens. All accommodations are chic, contemporary and have a mountain resort feel. Standard Room: Standard Rooms are cozy and comfortable. Enjoy two queen beds, full bathroom, seating area, Flat Screen TV, and coffee maker. Or expand into an adjoining Studio Suite. Sleeps 2-4 in 225 square feet of space. Studio Suites: Studio Suites offer space, comfort and convenience. Includes a Murphy bed and Split Sofa Bed as well as a full bathroom, wood-burning fireplace and a fully equipped kitchen. For guests who would prefer a separate sleeping area, an adjoining hotel room is a great option. Sleeps 2-4 in 480 square feet of space. Queen Loft: Experience "loft-style" living in Whistler and things will be looking up. The Queen Loft provides a semi-private bedroom loft area and convertible sleeping space in the living area. A full bathroom and wood-burning fireplace are also included. Guests enjoy a queen bed in the loft with the choice of a queen Murphy bed OR Split Sofa Bed in the living area. Stay in and get cooking with a fully appointed kitchenette with half-fridge, microwave oven and stove. Sleeps 2-4 in 450 square feet of space. Superior Loft: With room enough for up to 6 people, this is the sweetest of the suites at Whistler Village Inn + Suites. Enjoy a queen bed in the loft and a queen Murphy bed or Split Sofa Bed in the living area - perfect for up to 4 people.For groups of 6 the even Larger Superior Lofts offer a queen bed in the loft and Split Sofa Bed and a queen Murphy bed in the living area. A full bathroom, wood-burning fireplace and fully equipped kitchen make the Superior Loft a place you may never want to leave. Sleeps 4-6 in 550 square feet. One Bedroom: Popular because of their close proximity to the outdoor heated pool, spacious deck with BBQs, and Hot Tub the One Bedrooms have a lot of other things going for them... and you. There's room for up to 6 with a queen bed in the master bedroom, queen Murphy bed and Split Sofa Bed in the living area. With a full bathroom, fully equipped kitchen, flat screen TV in the bedroom and gas fireplace this has all the comforts of home - in the heart of Whistler.